Please select at least one search option. Blue Gum Forest is a fine, historic example of closed forest, situated in Grose Valley in Blue Mountains National Park. Get to it by walking track from Perrys lookdown or Pierces Pass. Greater Blue Mountains Drive takes in the iconic scenery of the Greater Blue Mountains World Heritage Area. Explore Glenbrook, Wentworth Falls and Katoomba and beyond. Located near Glenbrook in Blue Mountains National Park, Tunnel View lookout features scenic views of heritage train tunnels, wildflowers and birdwatching. Free. Park entry fees apply. Visit Blue Mountains Heritage Centre to get expert advice on walking tracks, Aboriginal heritage, plants and animals and activities. There are maps, books, art, gifts, wifi, coffee and a great virtual reality experience. Fees apply. Free park entry. Starting at Wentworth Falls picnic area, this walk passes epic lookouts with sweeping, amazing views of the waterfall plunging down into the Jamison Valley, before reaching the historic Grand Stairway. The hard Ruined Castle walking track rewards with historic mining heritage and scenic views over Jamison Valley in Blue Mountains National Park near Katoomba. A challenging 3-day hike, Six Foot track winds from Katoomba to Jenolan Caves, passing through Blue Mountains National Park and state forests. This walk is managed by Crown Land. Historic Federal Pass is a challenging walk in Blue Mountains National Park. Set out from either Leura or Katoomba and enjoy views of the Three Sisters, waterfalls and Scenic World. Challenging Glenbrook Gorge track offers rock-hopping along a creek bed in beautiful bushland, past an historic railway tunnel, in Blue Mountains National Park. 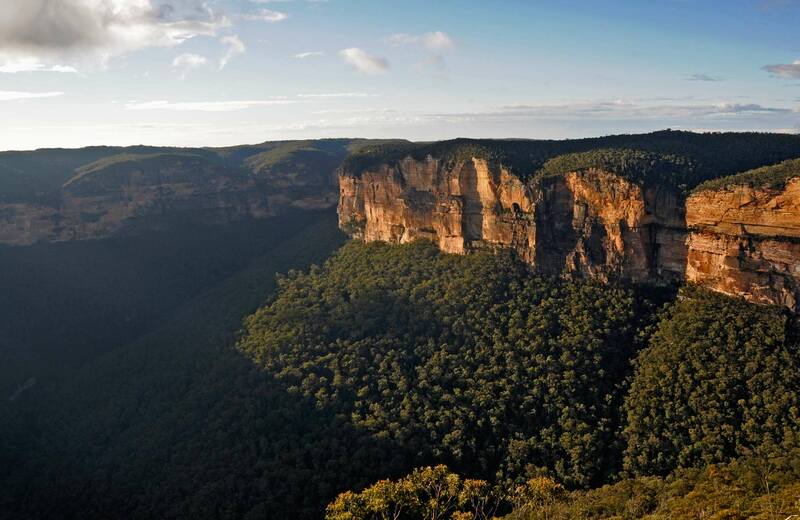 Take a challenging, multi-day hike over Mount Solitary in Blue Mountains National Park. Enjoy scenic mountain views, historic heritage, and bush camping, starting out from Katoomba.